My BFF Joan – 4:30am before work is a great way to start the day! Stay healthy and run forever with old friends and new friends. Spacecoast Marathon 2016. I ran without a watch. My only goal was to relax, enjoy it and give the glory to God. I ran light as a feather with a smile on my face and ended up with my PR. Paying it forward. I’ve had others encourage me through challenges in life. It’s rewarding to encourage others to get through the tough spots and accomplish their goal. 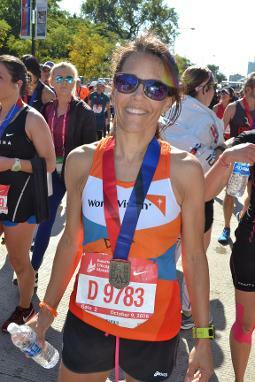 I especially enjoy helping first time marathoners get to the finish line and watching their friends and family cheer in wonder and amazement. Lifechanging for all involved. Once we have determined that my pace is where you want to be, all you have to do is stick with me and let me do the rest! Get your rest, fuel up, and be ready for a fun run! Once that starting gun goes off, we lay our burdens on the starting line and get it done! When people ask me what I’m training for, I say “I’m training for LIFE!”. That’s what it’s all about. Ready for anything! I enjoy serving as a board member for the Bulldog Track and Cross Country team and as a merit badge counselor for Troop 823 Boys Scouts of America.